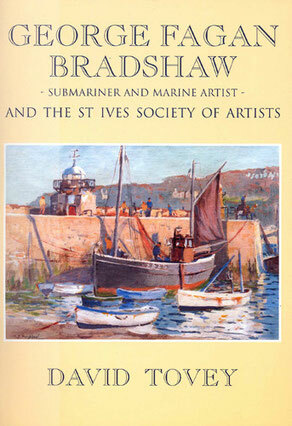 This book is both a biography of the marine artist, George Fagan Bradshaw (1887-1960), and a history of the first thirty years of the St Ives Society of Artists from its foundation in 1927, for Bradshaw was the principal instigator of the Society’s formation, Borlase Smart’s right hand man during the 1930s and the spokesman for the traditional artists at the time of the tumultuous split with the modernists in 1949. This event brought to an abrupt end the Society’s heyday, a period during which the yearly Royal Academy shows regularly boasted more than seventy works by members of the Society and touring exhibitions by the Society attracted ever-increasing numbers of visitors at many Municipal Galleries around the Country. With Creating A Splash having sold out, this biography is the best account of the heyday of the St Ives Society of Artists. George Bradshaw was born in Belfast in 1887. His family had a distinguished lineage but, after an unhappy childhood, he was sent off at the age of 15 to Dartmouth for Naval training. He elected to join the fledgling Submarine Service and served as a submarine commander with distinction during the First World War, winning a D.S.O. for the sinking of U-boat UC-43, whilst in command of submarine G-13. He also claimed to have sunk the mercantile submarine, the Bremen, sister ship of the famous Deutschland, but officially the fate of the Bremen is unknown. However, his career in the Navy ended messily. Just a few days after hostilities ended in November 1918, Bradshaw was in command of submarine G-11, when it was lost on the coast of Northumberland in thick fog, with the loss of two lives. This was probably due to equipment failure, and, certainly, Bradshaw was not responsible for the loss of a further submarine under his command, K-15, in 1921, when, due to a design fault, it sank in the tidal basin at Portsmouth whilst he was on leave, but, nevertheless, he was court-martialled. After his discharge from the Navy in 1921, he settled in St Ives in order to pursue his great interest in marine painting. There he met his vivacious wife, Kathleen, at the Simpson School of Art, where he was appointed Assistant, and he became a stalwart of the art colony until his death in 1960. Bradshaw was soon recognised as a talented marine artist, with good technique and keen powers of observation. His works, which display great variety and originality, were often accepted for the Royal Academy, but the St Ives Society was the focus of his art and life and he took great pride in the acclaim that the Society received in the 1930s and 1940s. He was, however, no fan of modern art and was one of the chief protagonists in the split which occurred amidst great acrimony in 1949. His consequent reputation as a "feisty old painter of storms at sea" is here re-assessed. Bradshaw continued to play a leading role in the Society’s affairs until his death and, although increasingly resentful at the backlash against traditional art in the 1950s, he found a new outlet for his paintings with the Society of Marine Artists, of which he was a founder member. The book reviews the whole artistic community in St Ives over a forty year period and highlights the tremendous contribution that the traditional artists made to the development of the colony’s reputation and to the promotion of Cornwall’s tourist industry. Works by many of the other leading members of the Society are discussed and their respective roles in the Society’s phenomenal success analysed. It is beautifully illustrated not only with Bradshaw’s works but also with paintings of Cornwall and, in particular, St Ives by many of Bradshaw’s colleagues in the St Ives Society of Artists, such as Lamorna Birch, Charles Simpson, Terrick Williams, John Park, Julius Olsson, Moffat Lindner, Borlase Smart, Dorothea Sharp, Arthur Hayward, Mary McCrossan, Helen Stuart Weir and Charles Pears.